For ten years, fans of Torchlight – an isometric action RPG similar to games like Diablo and more recently, Path of Exile – have held a seed of hope in their hearts inscribed with two words: “Torchlight MMO.” Runic Studios, the developer of Torchlight, openly discussed the studio’s goal to eventually make a Torchlight MMO after solidifying the core single-player experience. Years later, there was Torchlight II, which brought the game one step closer with multiplayer support. But the promising talk of an MMO began to die off as the studio seemed to be more focused on the core TL2 experience, seeming to drop the goal of an MMO in the future. Though Torchlight II did phenomenally, talk of the Torchlight MMO faded. When Perfect World – Runic Games’ parent company – announced the closure of the studio shortly after the announcement of layoffs at Motiga in late 2017, it seemed that a grave had been sealed for the fantastic Torchlight IP. And yet, bursting forth from the ashes is the phoenix: Torchlight Frontiers. 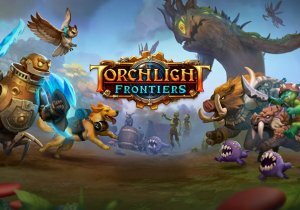 A surprise announcement in early August 2018, Torchlight Frontiers is being developed by Perfect World Entertainment’s new studio, Echtra Games, Inc., led by none other than Runic Games’ Max Schaefer. In fact, those following Runic Games’ Facebook account might have even noticed a promising note from Max back in June. Long story short: Torchlight isn’t dead, and the hoped for Torchlight MMO is being developed by many of the minds that originally guided the development of I and II. At PAX West 2018, Outfoxed and I sat down with Tyler Thompson, the Project Lead for Torchlight Frontiers. As both of us are fans of the IP, we needed no introduction and hopped straight into the show’s demo. Two classes were available for play: the Forged and the Dusk Mage. The Forged is a brand new class to Torchlight, and is the first robot to be a playable character. Perhaps its most unique characteristic is that its equipment actually swaps out parts of its body – meaning you can having different methods of locomotion (like crab legs) along with a different chassis, head, and so on as you change your gear. The class itself is supportive of both melee attacks – including some wide “spin to win” attacks – as well as long distance attacks from your chest cannon. Its core resource mechanic is Heat: certain skills and attacks build the Forged’s heat gauge, while other skills are designed to release heat once it’s built up. The system is designed in such a way you can’t simply do one or the other. Instead, you must constantly sway between build up and let-off rather than just hoard up for a boss fight. The Dusk Mage is similar to the mage archetype, but comes with new mechanics. Its main focus is managing light and dark power. Using light abilities charges the light bar, which empowers your dark abilities when full (and vice versa). The primary dark ability in the demo was a sort of spread shot, while the light abilities were a powerful single bolt, a ground-based consecration that increased regen, and a phase ability that let you run through enemies. The mage also has a unique flail-style weapon that sockets right over the mage’s hand and upper arm, along with a focus that can be used in the off-hand (unless you want to look super-crazy and use two flails). Although Torchlight Frontiers features a new user interface, as can be expected, the look of the game remains distinctly Torchlight. The main UI is clean and easy to follow, while the inventory and stat screens are made a little more modern and with larger elements so you don’t have to squint to read the bonuses on an item. Having recently picked up playing Torchlight II again, I had no problem adapting immediately to Frontiers, other than not being able to find pet management instinctively (something that may have even just been excluded for the current demo). Frontiers will still have procedural and random elements, despite being an MMO. Towns will remain static for everyone’s sanity. Next up are wilderness areas, which are phased instances that are randomly created on generation like ARPG maps typically are. These small instances support up to eight players, a nice balance between the complete isolation of Path of Exile‘s wilderness areas and Troves‘, giving the MMO feel of having others nearby to adventure with, without compromising too much saturation in an area. These areas also respawn, meaning that players won’t get stuck entering a map that’s been cleaned out already by someone previously. Connected to these areas will be dungeons, which will be more dangerous and isolated and give the more classic ARPG dungeon crawling experience. Tyler also explained that as of this build, wilderness areas have their maps already revealed without a fog of war, to make it easier to navigate from area to area and to locate other players. However, dungeons will keep the “fog of war” mystery to encourage exploration. One major change in Torchlight Frontiers is the lack of character level. Instead, characters have a representative “power level” determined by the strength of their gear in the area they are in. Each major area has its own sets of armor and preferred stats, and as players adventure further in these areas, they can obtain higher item levels that determine how strong they are, as well as the strength of the enemies around them and their allies. When a player enters a new area, the stats of their gear are “squashed” down to a low level, and they must adventure again to earn appropriate gear for the region. This also means that players have some freedom to explore areas as they want, and new players will not be vastly under-powered on a meta basis. Progression can be found in a new way with Torchlight Frontiers in the fort feature. Each player gets their own fort, a customizable housing area that serves more as a large base of operations than just a pretty place for hanging out with friends. Here players will be able to add vendors, buffs, areas for pets, and much more. These areas are being designed with an intent to encourage players to level multiple characters and classes in order to benefit from the forts fully. Additionally, forts will be able to be encountered by random players in the same area, giving players a chance to see and check out other forts as well as make use of some of their beneficial features. Join us in looking forward to Torchlight Frontiers in 2019 and stay tuned here on MMOHuts for upcoming exclusive reveals and giveaways! In the meantime, make sure you sign up for beta on the official website.